Does anyone have ideas about making metal stub axle replacements for those accursed Fly front stub axles? I think TSRF used to make these, but I cannot find them anywhere. I want a 3/32" axle with a large enough flange at the end to keep the part in place. This is for a Fly chassis where the motor placement prevents conversion to a solid front axle. Autoart seems to make metal stub axles for their Mustang, but I can't find them sold separately. Last edited by JML; 06-28-2009, 06:12 PM. I don't recall TSRF ever making such a thing. IIRC, WCR, Inc. sells a kit, 2 brass stub axle holders, a few risers to get them off the chassis, and a tube of JB Weld. Cannot help with the axle stub, but I have been known to cut the motor shaft on front motor Fly cars so that a straight axle will fit. I use brass rod for the replacement as even then, I may have to thin the shaft around the motor end. As a suggestion, why not use brass rod for your stub axles? You can solder a flat plate on one end and then cut to fit. You'd have to smack something immovable at a high rate of speed to bend those. Last edited by JML; 05-01-2009, 05:14 AM. I think somebody is having a joke at my expense. Funny thing is, I have a couple of Fly Viper chassis that I foolishly glued the motors into a while back without installing the front stub axles first (so now a bit of a challenge) to complete the reassembly. I look forward to seeing a smart solution to this that may or may not involve copious quantities of metal filled epoxy. From time to time I pick up my SCX Porsche Club Car and spin those front stub wheels just for the fun of it - proof positive that manufacturer's are actually capable of achieving this using plastic parts and a little care in assembly. The stub axles are held in place by E clips. [quote=Wet Coast Racer;298765]I think somebody is having a joke at my expense. If you have enough clearance you could probably tap about 1/8" on the inner ends of some 3/32" piano wire/drill blank stub axles. Then throw a 4-40 nut on the end with some screw glue to hold it. 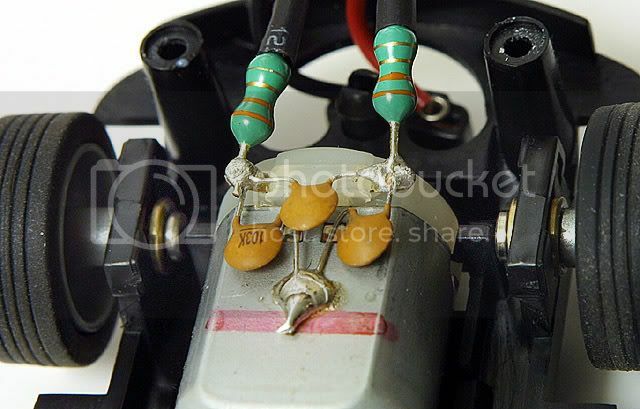 On a serious not, I though I have seen where the stock plastic is drilled out and a brass insert is put in. I'll see if I can dig it up. What John Schoen has shown from MBSlot above is similar to what TSRF used to offer. Cut the axle to length, use e-clips to hold the stubs in place. The TSRF axles were 3/32" diameter. MBSlot axle diameter I do not know. You also could solder a washer to one end of a length of 3/32" wire. Do it clean and neat and it will work well. Last edited by PROkofiev and the CONvict; 04-30-2009, 06:13 AM. Found it!!! Though it's for a solid front axle. Ream out to take 1/8 tubing so it can hold a stub axle, remove the middle section and add the MB Slot kit above? Last edited by redlynr; 04-30-2009, 06:21 AM. Make your own... Take a 3/32 axle and then get some brass tubing 1/8 od has a 3/32 ID and then cut a small piece for tubing and solder it to the end of the axle. the tubing will act as a cap and hold the axle in place.. I do much the same thing to make my independent front axles on all my cars.. Even with metal stub axles sleeving the axle carriers is a good idea. I had some 3/32" drill blank that I bought for rear axles but it is slightly larger than perfect and does not play well with Slot.it and BWA wheels. So a more suitable application might be for Fly front stub axles, where the slightly larger size would work better with the press on wheels. One has a regular nut, the other has a nylon lock-nut. Choice would depend on clearance. Anyone care to try a set? Send me your address and original stub axle length. If they work then send me whatever you think they are worth. Good ideas! I'll get the MB Slot axles and give them a try; that should cure Wet's problem, if he can get the E-clip in place (and probably fit a larger diameter plastic washer in there, too). Soldering up some brass tube and plate/washers sounds promising, too. Threading a 3/32 axle for a bolt is a nice thought, but on some narrow cars there may not be sufficient clearance for a bolt between the axle mount on the chassis and the motor, so something flatter may be required. Last edited by JML; 04-30-2009, 07:34 AM.